MALTA’S PRIME MINISTER Joseph Muscat has described murdered journalist Daphne Caruana Galizia as “his biggest adversary” but vowed to track down and bring her killers to justice. 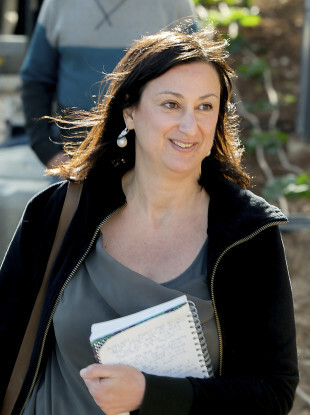 The centre-left premier, who was accused by the blogger’s son yesterday of being complicit in his mother’s death, attempted to shift the spotlight onto the main opposition Nationalist Party, saying it had been the focus of Caruana Galizia’s latest investigations. “It is unthinkable in a country like Malta to die for your job, in Caruana Galizia’s case for what she wrote,” Muscat said in an interview with Italy’s La Republica daily. “She was probably my biggest adversary, she attacked me from when I was leader of the opposition. But that was her job,” he said, adding that he had called in “the FBI and other European security services” to find her killers. Caruana Galizia, who had been called a “one-woman Wikileaks”, was killed in a car bomb on Monday. She had lately used her widely-read blog to make a series of detailed allegations of corruption in Muscat’s inner circle, some based on the Panama Papers data leak. Muscat refused to speculate on who might be behind her death, but said that “the easiest thing for me to do would be to point the finger against the opposition, the leader of which was the subject of Daphne’s latest stories”. In an interview with La Stampa daily, he raised opposition leader Adrian Delia again, saying the blogger had accused him of “money laundering, prostitution and more”. Muscat also said she had written on her blog about receiving threats “from people in the opposition” over the last month, but that he could not verify the claim. Yesterday, Delia called on Muscat to step down, accusing him of personally failing to safeguard the Caruana Galizia’s life. Muscat responded to that charge in an interview with Maltese TV, saying he could not impose police protection on someone who did not want it. Dutch forensic experts arrived on the island yesterday to aid the investigation. Police sources said Semtex explosives were believed to have been used in the car bomb, a demolition compound known to be favoured by terrorists in large-scale attacks. Cauana Galizia’s killing has sent shock waves around the world with the United States the latest country to condemn it. “It was a cowardly attack that took the life of a talented and brave reporter who dedicated her career to … shining light on corruption,” said State Department spokeswoman Heather Nauert. Email “Malta's Prime Minister calls murdered journalist his 'biggest adversary' but promises justice”. Feedback on “Malta's Prime Minister calls murdered journalist his 'biggest adversary' but promises justice”.